At Eclipse Power we understand all about electricity from generation through to connection. With the UK population growing year-on-year so is the demand for electricity. 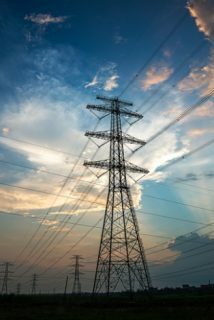 In this article we take a quick look at just one way that electricity is produced using a variety of different methods. Electricity generators convert kinetic energy into electric energy. They work through electromagnetic induction which involves the movement of an electrical conductor (e.g. coiled wire) in a magnetic field. The kinetic energy required for a generator can be produced in a number of different ways both directly and indirectly. In order to convert energy into electric energy a large amount of effort is required. In large power plants electricity generators are powered by steam turbines. Fossil fuels are burnt which boils water to make steam, the pressure from the steam then turns the turbine which is linked to a generator. Gas is one of the most flexible sources of generation and is an efficient form of thermal generation, meaning that more electricity can be produced from less fuel than is the case with other fossil fuel technologies. Hydro-power is the use of moving water stored in dams and flowing rivers. The movement of the water is used to turn turbines linked to a generator. Biomass is used in the same manner as fossil fuels. However, biomass is generated from renewable waste that would otherwise be sent to landfill. It is then burnt and the heat creates steam which then moves the turbine. A wind turbine starts turning when the wind propels the blades, this then spins the generator shaft creating an electric current. We are currently seeking suitable embedded generation development sites around the UK for peaking plant development. An efficient form of thermal generation compared to other fossil fuel technologies. We also have a portfolio of wind turbines across South Wales which we maintain and operate. For further information on any of the services that Eclipse Power Generation can provide, please contact us by calling 01234 486487.